(a) When using the hand-held tester: Check fuel pump operation. Turn the ignition switch ON and push the hand-held tester main switch ON. Select the ACTIVE TEST mode on the hand-held tester. Please refer to the hand-held tester's instruction manual for further details. Disconnect the hand-held tester from the DLC3. (b) When not using the hand-held tester: Check fuel pump operation. Remove the circuit opening relay from the R/B subassy. Using a service wire, connect terminals FP and +B of the R/B sub-assy. NOTICE: Pay close attention to the terminal connecting position to avoid a malfunction. Turn the ignition switch ON and check that the fuel pump operates. (c) Check that there are no fuel leaks after doing maintenance anywhere on the fuel system. (e) Remove the servive wire from the R/B sub-assy. (f) Install the circuit opening relay to the R/B sub-assy. (a) Check that the battery positive voltage is above 12 V.
(b) Disconnect the negative (-) terminal cable from the battery. (c) Purchase a new fuel tube and take out the fuel tube connector from its pipe. (d) Remove the fuel pipe clamp No. 1 from the fuel tube connector. (e) Disconnect the fuel tube connector from the fuel pipe by pinching part A with fingers, as shown in the illustration. Always read the precautions (see page 11-35 ) before disconnecting the fuel tube connector (quick type). The fuel pipe line may spray fuel as a result of retained pressure that remains in it. Do not allow fuel to be sprayed in the engine compartment. 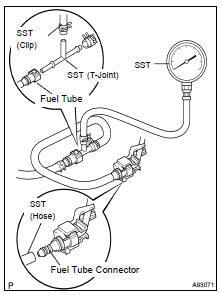 (f) Install SST (pressure gauge) and fuel tube connecter using SST as shown in the illustration. SST 09268-41047, 09268-45014 (09268-41250) (g) Wipe up any gasoline. (h) Reconnect the negative (-) battery cable. (i) When using the hand-held tester: Operate the fuel pump (see step 1 (a)). (j) When not using the hand-held tester: Operate the fuel pump (see step 1 (b)). (k) Measure the fuel pressure. Fuel pressure: 304 to 343 kPa (3.1 to 3.5 kgf/cm2, 44 to 50 psi) If the pressure is high, replace the fuel pressure regulator. If the pressure is low, check the fuel hoses and connections, fuel pump, fuel filter and fuel pressure regulator. (o) Check that the fuel pressure remains as specified for 5 minutes after the engine has stopped. Fuel pressure: 147 kPa (1.5 kgf/cm2, 21 psi) If the pressure is not as specified, check the fuel pump, pressure regulator and/or injectors. (p) After checking the fuel pressure, disconnect the negative (-) battery cable and carefully remove SST and fuel tube connector to prevent gasoline from spraying. (q) Reconnect the fuel inlet tube (fuel tube connector). CAUTION: Always read the precautions (see page 11-35 ) before connecting the fuel tube connector (quick type).